He was part of one of the funniest television tandems ever. As one half of “The Odd Couple,” Jack Klugman entertained, and kept audiences laughing with his slovenly character Oscar Madison. But in real life, Klugman was a hard-working man who went from having nothing to achieving stardom. He overcame a tough childhood to become a celebrity in a field many people told him he was not cut out for. But the challenge of becoming a successful actor wasn’t the toughest one he would face. After he made his mark in Hollywood , he was faced with a test of significantly greater proportions. 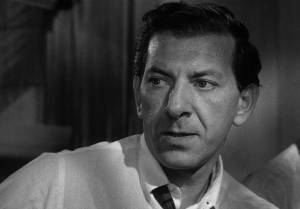 But Klugman persisted, and eventually became accustomed to acting, and even good at it. In 1949, he made his non-salaried stage debut at the Equity Liberty Theatre. Even though he was on stage, the times were still tough. He and his roommate Charles Bronson had to take many menial jobs to make the rent every month. At one point Klugman was even selling his blood for $5.00 a pint. He finally got his break in television, and made appearances on many shows including “The U.S. Steel Hour” and “Alfred Hitchcock Presents.” He also made appearances on “The Twilight Zone” where he and Burgess Meredith are tied for having made the most appearances, at four episodes each. His first big break came when he appeared on the TV show “The Defenders” and won an Emmy for his performance. In 1970, came the role he is most remembered for in the “The Odd Couple.” In this show he played Oscar Madison, a newly divorced sports writer who shares his apartment with Felix Unger, a photographer who is also recently divorced. The two characters are complete opposites, with Felix being a neurotic neat freak and Oscar being a cigar-smoking slob. The clash of opposites made for hilarious television, and was a huge hit. Klugman won two Emmy Awards for his portrayal of Oscar. After a long run in “The Odd Couple,” Klugman went on to star in another popular, long running show, “Quincy, M.E.,” where he played a tough medical examiner who had a penchant for solving crimes. It was the forerunner of many shows to follow in which forensic medicine played a central role. Klugman had one bad habit in common with his most notable character, smoking. Like Oscar, Klugman always had a cigarette in his mouth. When asked why he started smoking, Klugman talked about influence. “I saw John Garfield smoke. He was my idol, so I smoked. I even smoked like him.” And smoke he did. Klugman managed to accrue a significant habit. The many years of cigar smoking most likely were the causative factor in his development of an oral cancer. He was diagnosed with cancer of the larynx in 1974. With surgery and some treatment, he was able to continue acting without much interruption. But Klugman did not stop smoking, and as in many cases of continued tobacco use after treatment, the cancer came back. In 1989, he underwent surgery again to remove the cancer, but this time his right vocal cord had to be removed as well. The surgery left him without the ability to speak. Klugman has always said that fear is a great motivator. He said it was fear that had propelled him into acting, and that fear can be used to help you reach your dreams. The fear of his oral cancer and the loss of his voice made Klugman open up to loved ones and friends to seek their help and support. Without their support, Klugman maintains, he would not have survived. His friends and loved ones helped him through the agonizing pain of the chemotherapy and surgery as well as the rehabilitation to recover his voice. After being silent for years, Klugman is now able to speak in a small raspy voice. He recently received the American Speech and Hearing Association’s International Media Award for his battle to regain his speech. While the poor choice of long term tobacco use lead to his physical difficulties, Jack Klugman is a role model in many other ways. Overcoming a difficult, poor childhood, striving to succeed when others tell you that you will fail, and battling back against a killer like cancer, all put him in a league of his own. Brian Hill / OCF note: Mr. Klugman has recently made his return to prime time TV appearing on the drama series “Crossing Jordan “, ironically as a medical examiner. He has also done a live, two-hour one man show, “An Evening with Jack Klugman” which received fantastic reviews, in which he recounts his many anecdotes of working with the legends of entertainment over 5 decades such as Bogart, Garland, Fonda, Randall, and more. While the LA Times reviewer wrote that it “was an impressive extemporaneous feat by any standards”. I would like to note that besides it’s contents, delivery and entertainment value, you must consider that this event, which ran until Oct 8th of 2003, was done by an individual that with just half of his larynx (vocal box) left after surgery, and a few years earlier could not even speak. His extraordinary battle and strength of will to overcome this and return to the stage makes him a survivor and a fighter of the highest caliber, and his example shows all of us that in spite of what may seem insurmountable odds, a full and rich life still is possible. Mr. Klugman’s fight and determination, make him one of two survivors that are my personal heroes, the other being Lance Armstrong. He is an inspiration in the truest meaning of that word. We congratulate Mr. Klugman on his successful battle with oral/throat cancer and return to prime time TV, and to his many fans. In February 2004 Mr. Klugman agreed to help OCF produce it’s first Public Service Announcement for broadcast on national TV. We are excited about the possibilities that working with someone of his caliber present. Mr. Klugman continues to reengage himself in the business of television, theater, and writing. He has now published a wonderful book about his friendship with actor Tony Randall, as well as appearing in the movie “When do we eat?” released in spring of 2006. In may of 2006 Mr. Klugman, after being nominated by OCF founder Brian Hill, will be presented the Strusser award for public service from the NYU School of Dentistry at Madison Square Gardens in New York City. He continues to be an example of quality life after oral cancer, and a vocal proponent of early detection. *** The foundation is sorry to add to this profile that in 2012, Mr Klugman passed away from age related disease. He was a good friend to the foundation, and a vocal supporter of oral cancer patients everywhere. He and his impact in raising public awareness of our disease and in particular the relationship of tobacco to it, will be truly missed.